Raspberry rose garden dress, the name itself is so tempting. Isn’t it? Well, just imagine how sweet your baby is going to look in a dress which itself sounds so sweet. 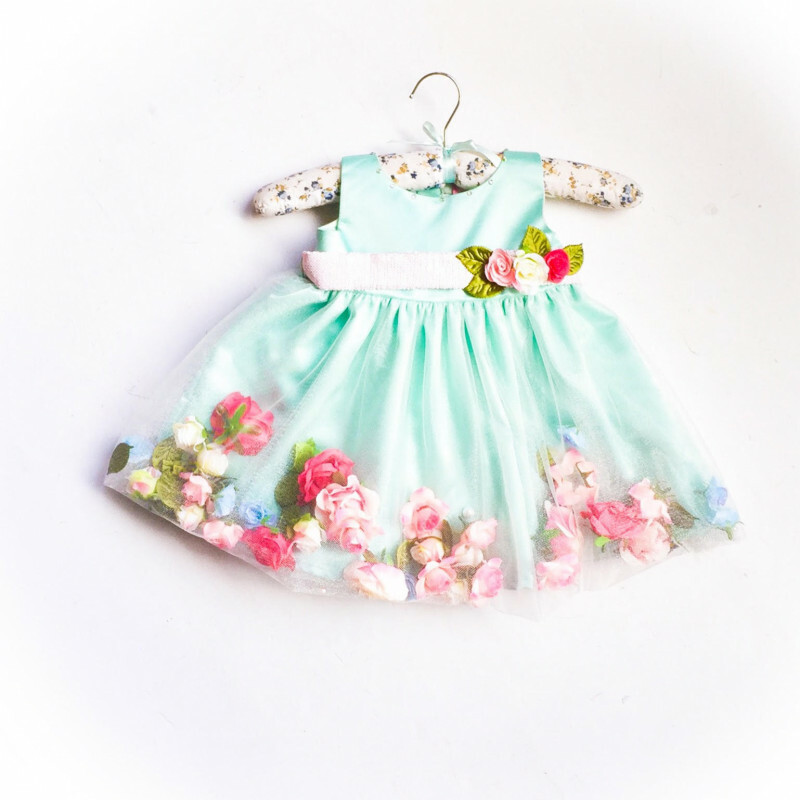 This little garden dress is all about flowers and surely is going to take a special place in your munchkins wardrobe. This sleeveless gorgeous dress has embellishment on the neck and a flower applique on the waist band. Grab it now to see that special smile of your baby in this beautiful dress admiring herself in the mirror. Since we mentioned before that this new addition is a blend of both ethnic and western wear, here we are giving you a look at the best piece of ethnic we have at the store. You just cannot make your baby wear western in festivals and in weddings. 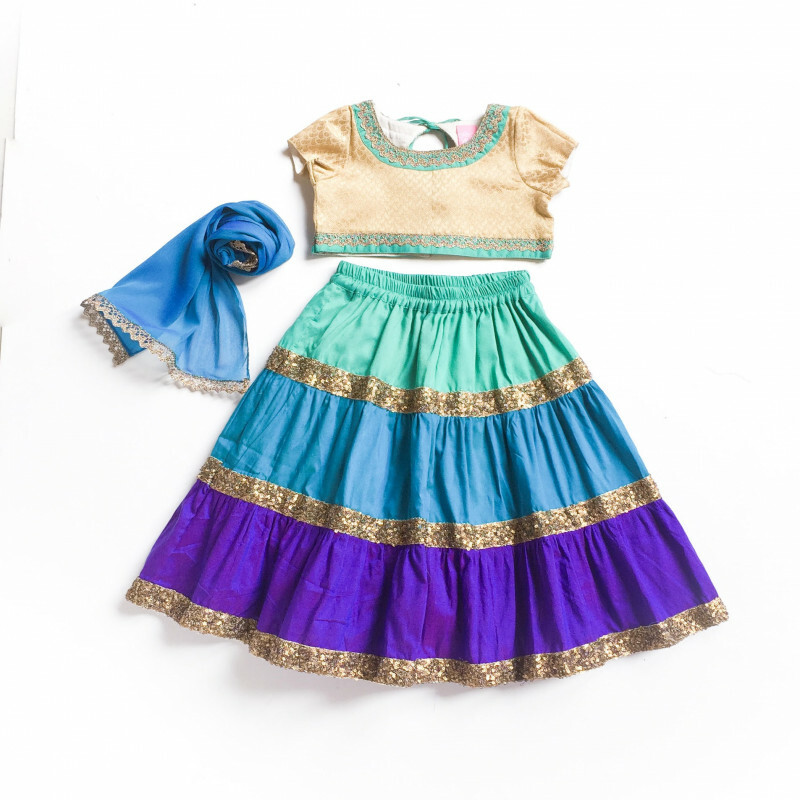 So for such auspicious occasions you need ethnics and here we have a perfect lehnga choli for your little daughter. We assure she is going to rock the wedding in this lehnga, she is going to get attention no less than the bride. Why not let her feel like a queen? Roses, we all love them right! They smell good. They look good. They feel good and when blooming in a dress they look just beautiful. Imagine how adorable your little baby going to look with a dress full of such beautiful roses. The roses will give a refreshing touch to your girls closet. The lace work on the hemline is the added charm to the dress and the neck design is worth loosing your heart for. It also has rose applique on both the bodice and the flare. Mint is a must to have color in your little divas wardrobe and thus we have here one perfect sleeveless mint dress. It is a charming attire to make her wear in any occasion. 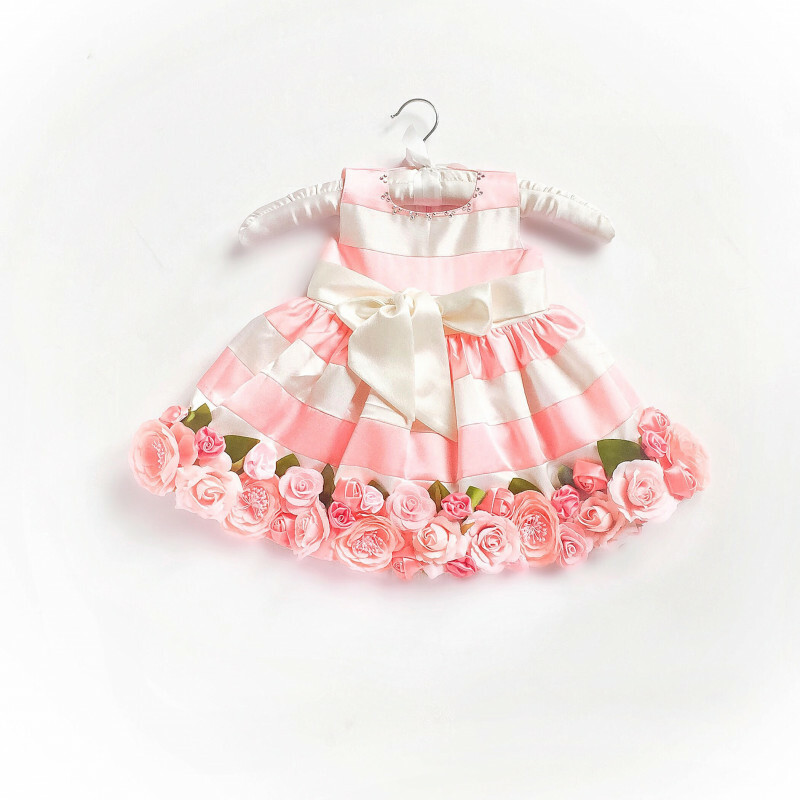 The horizontal pink and white lines is a beautiful combination to dress your baby girl in. The dress has a cute ribbon bow waistband and also has embellishment around the round neck. The heavy flower applique on the hemline is giving the dress an extra grace. Peach is another must to have color in a girls wardrobe. 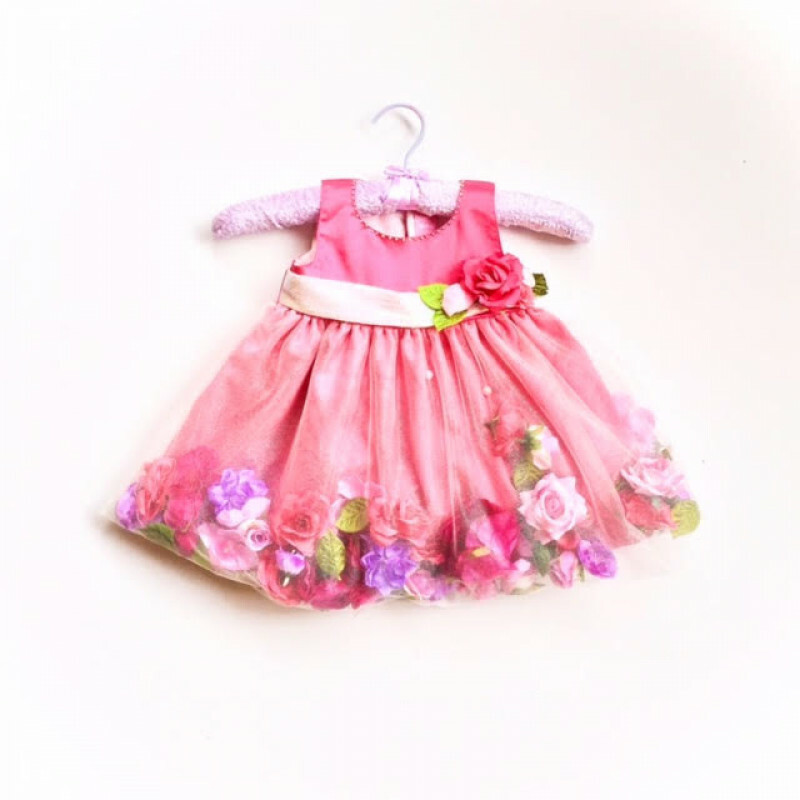 So why not pick this dress up and complete your little girl’s collection. This is a gorgeous peach color dress your baby is going to look beautiful in. We know you are already imagining her beauty. This is a party dress so you can make her wear in any birthday party she is invited to this month or any upcoming family gathering or outdoor get together. This is a perfect dress for even an outdoor event. The cute ribbon on the waistline will give your baby a cute look and the roses embedded on the hemline is going to give her princess feels. Grab this dress and make her feel special. So this was the sneak peak to our new addition, little pixie. For more stay tuned, pick up your laptop, or just get that smart phone out of your pocket to browse some amazing dresses for baby girl and pick some best one to make your little munchkin’s day wonderful and wardrobe beautiful. The post Little Pixie: New Addition To The Babycouture Store appeared first on Baby Couture India.